In the example below, we demonstrate how a clinic might use this action to send an email to staff notifying them that a mother has been registered. @flow.due_date references the due date collected at a previous step in the flow. The same is true for @flow.first_child. This action is also a super simple way to push a contacts’ inquiry to a team member. Simply create a flow that asks for a contact’s name, inquiry and preferred response method, and configure your account to send an email containing that info off to your support feed or Slack channel. Team members will be able to instantly access the ticket via your CRM or Slack feed and respond accordingly. The variable @flow.name references the name of the contact if you collected it at a previous step, while @flow.inquiry and @flow.preferred_channel reference the contact’s inquiry and the way they’d like you to respond (SMS, Call, Email), respectively. Note that if a contact's "Name" field has already been given a value, you may substitute @flow.name for @contact.name or @contact.first_name. By default, we send emails from a Nyaruka support address. 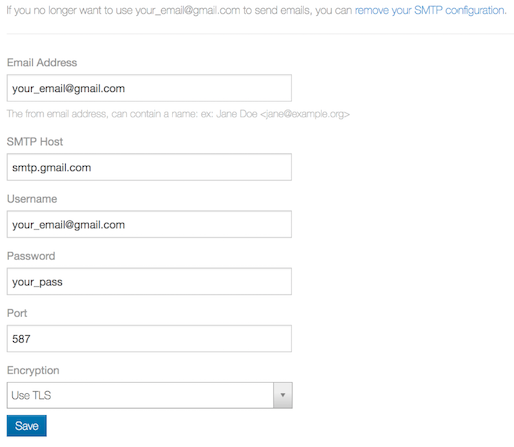 If you’d like to add your own address, simply navigate to your account’s settings page and click the email icon. Here we’re using a Gmail-hosted email address. You’ll want to plugin your email address, host URL, credentials, port and encryption preference. Note that sending an email from a flow does not use any credits!